Why is fashion so obsessed with gothic fonts? From goths to LA gangs, Gucci to Vetements and even Justin Bieber – what’s behind the script’s resurgence? Whether you blame Kanye West and his Life of Pablo merch or Vetements and their longer-than-longsleeve t-shirts, one thing is certain: blackletter fonts are everywhere right now. The bold and medievalesque style, sometimes referred to as gothic or Old English, has quickly risen to the go-to typeface choice for designers and labels alike this year – just look at Gucci’s SS16 menswear show, where it popped up on a hoodie. The letters may be sweeping through mainstream men’s and women’s fashion right now, but the style is nothing new. It’s long been found in gothic subculture (featuring in the pages of 80s and 90s goth bible Propaganda, for instance) and has been a frequently used motif in the world of streetwear for years. Before Vetements or Pablo, pioneers like New York’s SSUR (founded back in 1990) as well as newer brands like Been Trill have been using the letter style – even A$AP Mob made use of the font for their debut collection of namesake merch in 2013. Born x Raised is a Los Angeles streetwear label that has embraced a variant of blackletter since day one. The duo behind the brand, Spanto and 2tone, channeled the frustration and anger they felt from the gentrification overtaking their hometown into a debut collection with no shortage of the Old English font and its links to LA gang culture. “Those letters and that traditional layout are a part of my culture as a gang member,” Spanto explained to Dazed. When Kanye West hit Madison Square Garden with his extravagant fashion show meets TLOP listening party back in February, the performer debuted a range of concert merchandise adorned with his newest lyrics – each phrase carefully set in a bold blackletter font. Die-hard Yeezy fans quickly pointed to the Donda West crewneck sweater he has been spotted wearing since 2015 (most famously in Vic Mensa’s “U Mad” music video) as the inspiration. 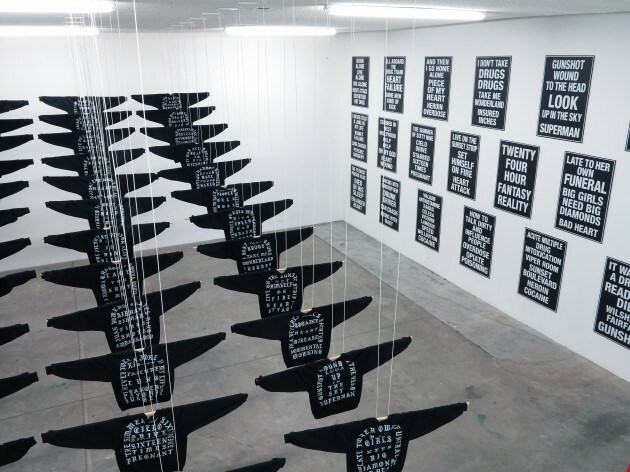 The artist behind the immensely popular Pablo-themed merch (and original DONDA design) was Cali Thornhill Dewitt, who had exhibited a series of similar pieces back in a 2014 LA exhibition and partnered with Berlin-based 032c to produce one the following year. The Pablo merch quickly turned into a global phenomenon. West and his creative team continued to riff on the same design format in the upcoming months, releasing new variations, garments and colorways as he performed at a number of high-profile festivals, and created pop-up shops in New York, Paris and Los Angeles. The more merch Kanye made, the more popular the font seem to get, with fakes springing up in high street retailers like Forever 21. But months before Yeezy unleashed the TLOP merch on the world, a similar trend was already on the rise thanks to the surging influence of Demna Gvasalia and Vetements. With Kanye in the crowd, the fashion collective debuted the font for SS16 down the sleeves of pieces soon worn by everyone from Kylie Jenner to American basketball player Russell Westbrook. 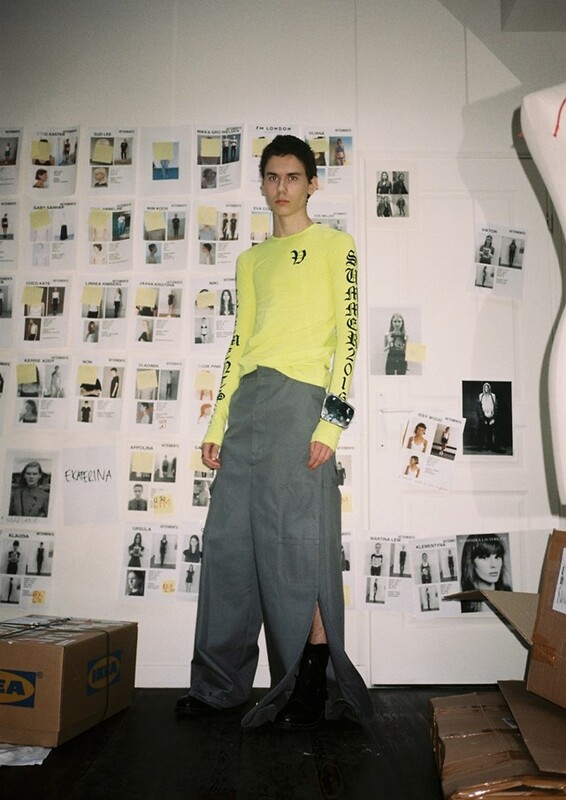 It’s here the trend becomes entangled with another prominent phenomenon that Vetements has been fundamental in – a new obsession with the iconography of heavy metal. Both the font and the metal-inspirations (most prominent in AW16) found fans in Justin Bieber and then Rihanna, who incorporated the style in their latest arsenal of concert merchandise. And that’s only the beginning. Marcelo Burlon showed pieces incorporating blackletter at his SS17 show, Australian designers Daisy used it in their latest collection, as have acclaimed newcomers like Second/Layer and many others. Lots of designs have seen the font printed down sleeves, like the original Vetements garments. Sure, Kanye may have helped usher in newfound popularity and Alessandro Michele added some upscale credibility, but blackletter has gained momentum from more designers and collections than you can count. The blackletter fad is unique because it’s a marriage of various moments currently happening in fashion – the sudden resurgence of concert merch, a love of heavy metal, and an emphasis on streetwear that’s even being adopted by the most old school fashion houses. But with the typographic style seemingly everywhere you look, it’s hard to see where the trend will go from here. The downside to any aesthetic is oversaturation, when things become so ubiquitous they lose their power or meaning. How many wearing Pablo shirts know they are borrowing a style from Hispanic LA gangs, you wonder? And how long will it be before we disregard gothic, graphic garments for the next big thing?